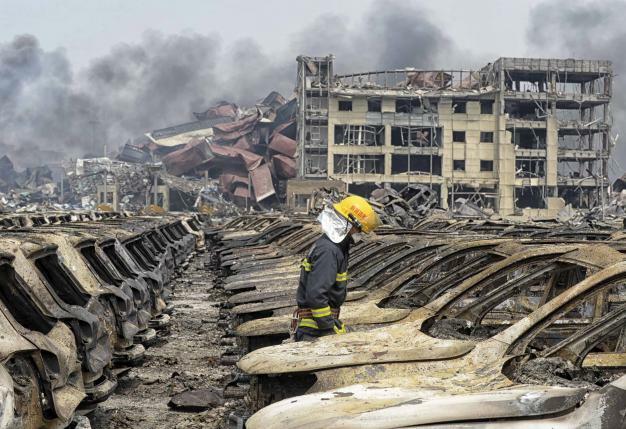 TIANJIN – Chinese police have for the first time confirmed deadly sodium cyanide at the site of two huge warehouse blasts that killed 85 people, state media said on Saturday, as a series of new, small explosions were heard and small fires broke out. Police confirmed the presence of the chemical, fatal when ingested or inhaled, “roughly east of the blast site” in an industrial zone in the northeastern port city of Tianjin, the state-run Beijing News said. It did not say how much had been found or how great a risk it posed. The blasts late on Wednesday originated in a warehouse storing toxic chemicals and some residents expressed concern that the air and water could have been poisoned. An area three km (two miles) from the site was cordoned off while one school, which had been set up as a safe haven for residents living close to the danger area, had since been evacuated, the Beijing News said. It did not give a reason. “At the moment, the (air pollution) does not pose much danger to those in the vicinity,” said Bao Jingling, a former engineer with the city’s environmental protection bureau. Harmful substances could not be detected in the air from 17 monitors placed around the city, said Bao. with around 721 injured and 33 in serious condition, Xinhua news agency said. Shockwaves from the explosions were felt by residents in apartment blocks kilometres away in the city of 15 million people. Twenty-one of the dead were fire fighters. About a dozen family members of missing fire fighters tried to storm Bao’s press conference, angry at a lack of information about their loved ones. “We have gone to each and every hospital by ourselves and not found them,” said Wang Baoxia, whose elder brother is missing. “There is no government official willing to meet us. Not even one,” she said. Relatives said around 25 fire fighters they said were missing were young contract workers not part of official city fire brigades. After Wednesday’s blasts, fire crews were criticised for using water to douse flames which may have contributed to the blasts given the volatile nature of the chemicals involved.